The 1893 Act of Congress that halted Civil War pension payments to non-residents of the United States who could not prove their citizenship is a topic I have explored frequently on previous occasions (see for example my book The Forgotten Irish and The Pension Crisis of 1893 which I wrote for the Clara Barton Museum). Although it proved a short-lived measure, unsurprisingly it caused a mixture of despair and consternation among pensioners living outside of America. This did not only impact dependents, but also many former servicemen– servicemen who were not shy about expressing their outrage. One of them was John Egan, a native of Co. Laois, who had been Quartermaster of the USS E.B. 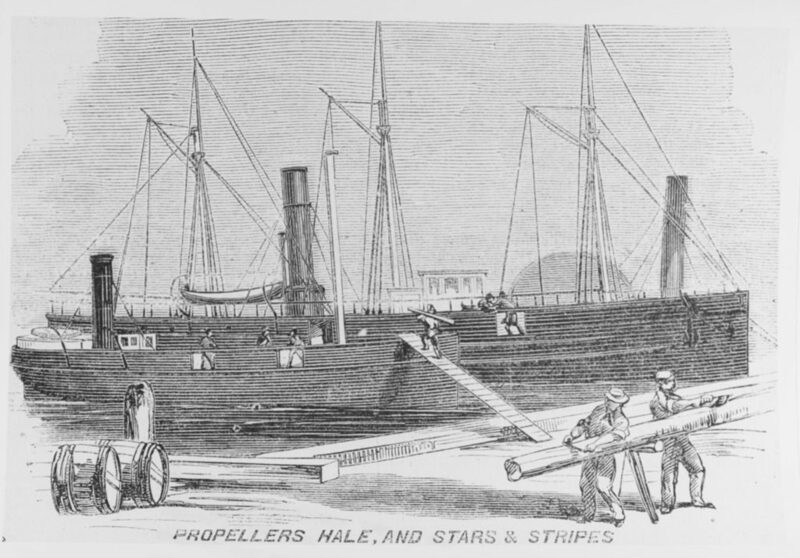 Hale during the Civil War. 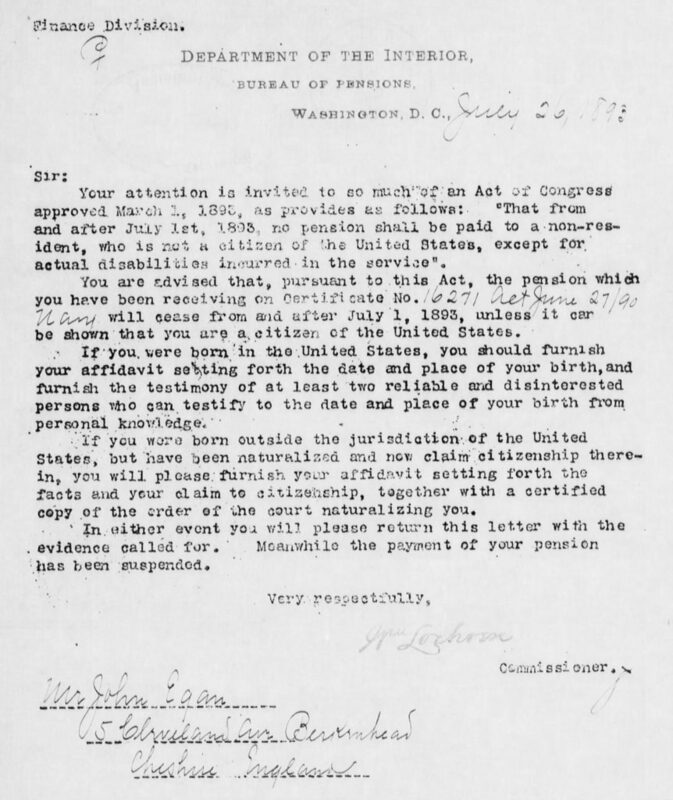 The 1893 letter to John Egan which informed him his pension would be stripped unless he could prove his citizenship, regardless of his service (NARA/Fold3). Sir, I wish to know if my wife and five children is to be starved here for not having citizen papers. Pray who do you call citizens but men that volunteered their services when the nation was almost torn to pieces by her enemies. I was in the services of another nation at that time and the support of an aged mother. The ship I was in was an 91 gun war ship in halifax harbour Nova Scotia orders come to be ready for war with Amarica. I left that ship and two years pay and joined you. Well Sir don’t you think I am worthy to be a citizen this was the time Slidell and Mason was taken from Mail Steamer Trent. Sir would you be kind enough to give me a passage out to get employment in the States everywhere I go I am asked if I am an naval reserve man and because I am not I can’t get work the only thing for me is the workhouse if you do not assist me out. An early answer will oblige. John’s letter walks a line between condemnation and appeal, two features common to much of the correspondence written by European pensioners in response to the Act. He makes sure to highlight the dire straights he and his family would be in as a result of the suspension of payments, while at the same time seeking aid to travel to America to improve his situation. He also notes that his decision to support the Union in the 1860s was still having a major negative impact on his life, as he was not in the Naval Reserve (another indication that he likely deserted) and so could not secure work. John may have been somewhat overstating his ideological drive to abandon the Royal Navy in favour of the American Republic, but he was understandably attempting to leverage as much emotional capital as he could. 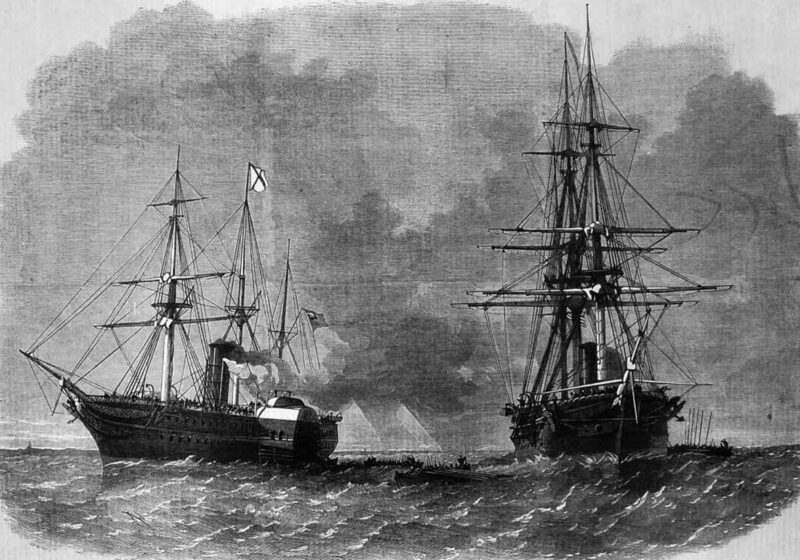 Interestingly he also referenced the Trent Affair, the major diplomatic incident in late 1861 which caused major frictions between the United States and Britain (you can read more about it here). As with all the other pensioners, John’s payments were ultimately reinstated. He appears to have taken decisive action in order to insure there would be no further risk to his entitlements, making the decision to relocate to the United States. By 1894 he was Washington D.C., probably part of an initial effort to get his payments reactivated. He then moved his family to Philadelphia, where he would work as a Junk Dealer. He and his wife went on to have a total eight children, six of whom survived to adulthood. They never appear to have fully escaped their financial precariousness; when John was medically examined in the late 1890s he was variously described as “poorly nourished” and “rather emaciated.” Despite this, Quartermaster Egan of the E.B. Hale ultimately enjoyed a long life, passing away in his adopted country on 27th April 1927. He is buried in Philadelphia’s Holy Cross Cemetery. John Egan Navy Survivor’s Certificate 16271.